Synthetic peptide corresponding to Human FIF aa 150-200. Previously labelled as Apoptosis inhibitor 5.
ab99308 was affinity purified using an epitope specific to FIF immobilized on solid support. Our Abpromise guarantee covers the use of ab99308 in the following tested applications. Antiapoptotic factor that may have a role in protein assembly. Negatively regulates ACIN1. By binding to ACIN1, it suppresses ACIN1 cleavage from CASP3 and ACIN1-mediated DNA fragmentation. Also known to efficiently suppress E2F1-induced apoptosis. Its depletion enhances the cytotoxic action of the chemotherapeutic drugs. Expressed in all tissues tested, including heart, brain, placenta, lung, liver, skeletal muscle, kidney and pancreas. Highest levels in heart, pancreas and placenta. Highly expressed in several cancers. Preferentially expressed in squamous cell carcinoma versus adenocarcinoma in non-small cell lung cancer. Belongs to the API5 family. Two regions, an N-terminal (aa 96-107) and a C-terminal (aa 274-311) are required for binding FGF2. Cytoplasm and Nucleus. Cytoplasm. Mainly nuclear. Can also be cytoplasmic. 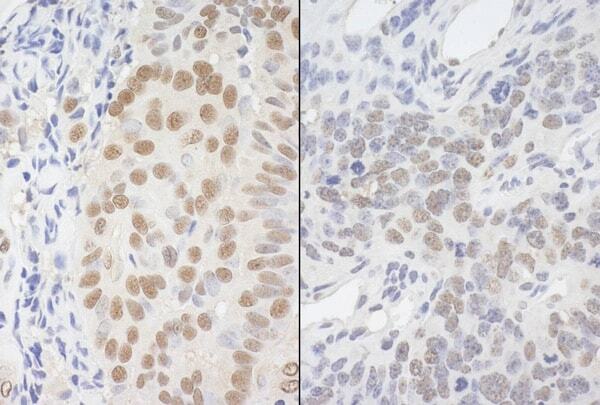 Immunohistochemistry (Formalin/PFA-fixed paraffin-embedded sections) analysis of human breast carcinoma (left) and mouse teratoma (right) tissues labelling FIF with ab99308 at 1/5000 (0.2µg/mg). Detection: DAB. anti FIF (ab99307), at 0.4 µg/ml, staining FIF in HeLa whole cell lysate immunoprecipitated using ab99308 at 3 µg/mg lysate (1 mg/IP; 20% of IP loaded/lane). Detection: Chemiluminescence with an exposure time of 1 second. ab99308 has not yet been referenced specifically in any publications. Publishing research using ab99308? Please let us know so that we can cite the reference in this datasheet. There are currently no Customer reviews or Questions for ab99308.